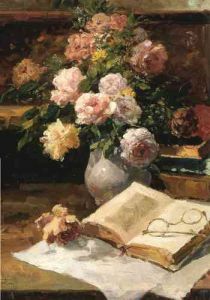 A vase of beautiful roses and an enjoyable book are some of life's simple pleasures. They were considered treasures to my Grandmother in her later years. She was a thankful woman who loved God and cherished His Word, especially the Psalms. She was also an artist who loved painting still-lifes of roses. These were truly some of "Her Favorite Things."